Successfully Added Foldable Design, 2 x 1690 Lumen LED, Silver Reflective Interior, No Shadows, Professional-Grade Pictures to your Shopping Cart. The Puluz Portable Photo Studio is the ultimate gizmo for all photographers out there. This foldable photo studio allows you to snap professional grade product pictures anywhere you go. It features an extremely compact and lightweight design, making it easy to carry along. Therefore, you’ll always be able to have your own private photo studio at hand no matter where you go. The foldable photo studio is easy to assemble and use for anybody out there. Simply unfold your photo studio, plug it into your wall socket, and you’re ready to go. 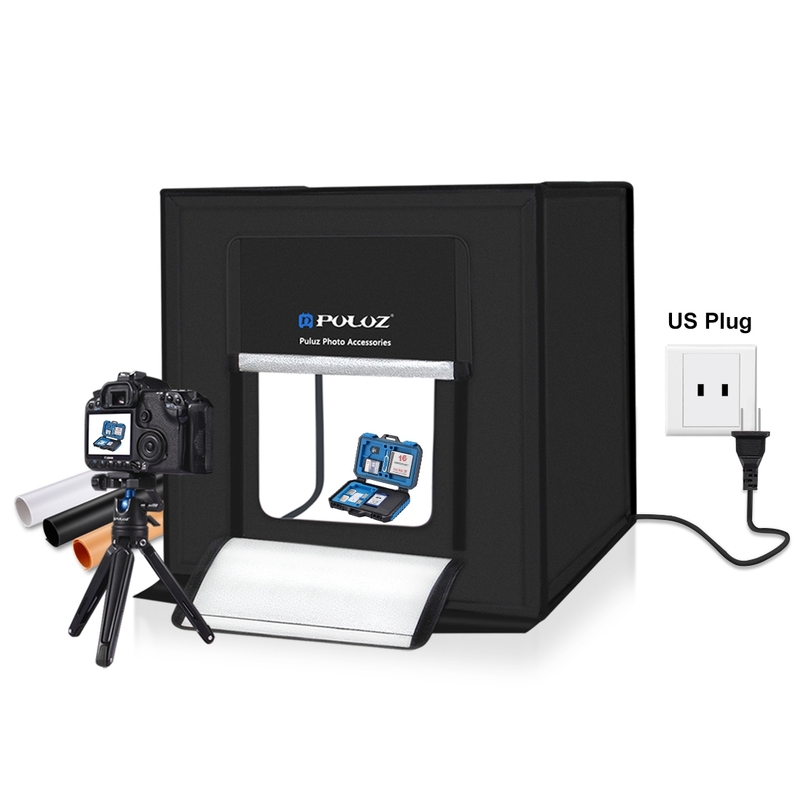 This is an all-in-one package that features all you need to snap studio-grade photographs from home or in the office. Thanks to its affordable price and compact size, the Puluz Portable Photo Studio is a great gizmo for small business owners and self-employed photographers. This little foldable photo studio can be easily set up and used in any small room or office. The photo studio comes with two 1690 lumen LEDs that generate super bright and accurate light. It has been crafted out of durable nylon cloth and features a silver reflective interior. The latter makes sure that all pictures end up without shadows and will have a pure and bright white background. Additionally, it comes with an orange and black background paper to meet all your photography needs.